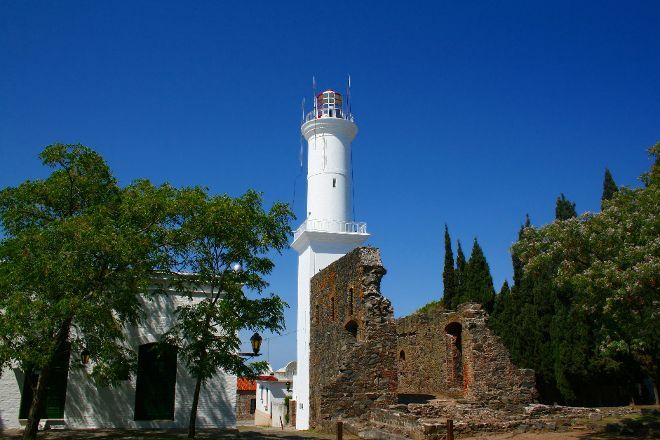 Visit Colonia del Sacramento Lighthouse for a chance to look out over waters that have claimed countless ships over the centuries. The iconic lighthouse, overlooking the Rio de la Plata estuary, helped save many vessels navigating the savage currents in the black of night. First illuminated in 1857, the lighthouse remains in use today. Climb up its spiral stairs to enjoy the views over the harbor, and over the historic city. Use our Colonia del Sacramento visit planning app to add Colonia del Sacramento Lighthouse and other attractions to your Colonia del Sacramento vacation plans. We were in the city of Colonia del Sacramento, Uruguay, 1 hour from Buquebus in Buenos Aires, and we love it! A historical city, a UNESCO World Heritage site! Beautiful and well preserved historic center! When you go up you can see beautiful views of the city. Nice experience to know a lighthouse inside. Great all round views from the top of this lighthouse. There are two levels, if you chose to go upto the second top level, make sure you have a good head for heights. It's a narrow tight staircase and little space to move around at the top. Additionally the railing around the top barely reached waist level for me. It would be all to easy to lose your balance if you lent over too far and fall. Keep back from the edge. Great views out to sea and across the old town. You can pay the small entrance fee in either Argentine or Uruguay Pesos. This is beautiful place have visit in the winter and in the summer. It’s great for kids and parents.